DF.HUNNY started its operations in 2004 in Sydney, Australia and it is a family owned and operated business. DF.HUNNY is the number one wholesaler of African food products and sole distributor of OLA-OLA products in Australia & New Zealand. We strive to be your primary African foods distributor and our aim is to provide you with quality products and services. Pounded Yam, Plantain fufu flour, Potato Starch, Cassava Starch, Bean flour, Ground rice, Rice flour, Cassava flour, Akpu-Fufu, Elubo/Amala and Plantain Chips. 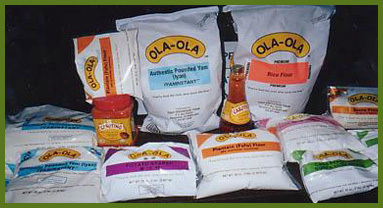 Our other brand products are the Ola-Ola Carotino cooking oil and the Ola-Ola cholesterol-free red palm oil. Copyright © 2008 DF.HUNNY Foods International. ABN: 81 151 013 688. All rights reserved.